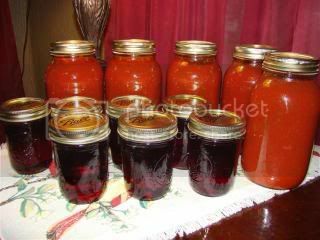 Seems the canning bug has started early here at TSB and I thought I would show the product of my efforts from the past few days. I have a friend who makes the best salsa ever and she was gracious enough to share her recipe with me a couple of years ago. I have since tweaked it a bit to include a hint of cilantro and my family just cannot get enough of it. The smaller jars are a concoction I made from blueberry tea and grape juice. I do not normally make jelly, as I have been afraid of it in the past. I am not certain if it is the skimming, or the worry over the jelly not setting properly, or if it is that I prefer a great fruit filled jam or butter instead.